Jenny Parsons is currently riding the “Green Train”, she caught it in Toronto but Elizabeth May has been riding it across Canada. 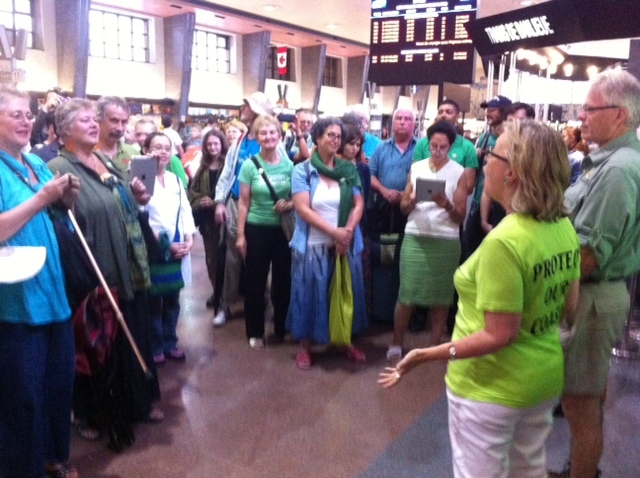 The Train will arrive in Fredericton New Brunswick for the 2014 Green Party of Canada Annual General Meeting. Jenny Parsons is representing the Bruce-Grey-Owen Sound Green Party of Canada and will be writing a daily journal for our website. We look forward to hearing about her adventure and all the topics that will be discussed. I join the Green Train in Toronto. Elizabeth May started in Vancouver on July 11, four days earlier. She is gathering up supporters along the way and making speeches as she goes, that is if time allows it. The platform stations are littered with people who have come out to greet her. They have brought their babies and their campaign lawn signs and their good will. She has followers in every little stop the train makes. Some supporters even join the train. I have met Winnipeg Greens, some Montreal Greens and when we get to Fredericton tomorrow, there will be some East coast Greens. There are murmurings about nuclear waste, electoral reform and climate change but the directed group-discussions will begin tomorrow. You can tell the people who have been on since the start, they are waiting for a second wind and have become a little bleary-eyed. Not so, Ms. May. She radiates an energetic ease. She looks determined. There is a Federal election coming and much work to be done but now we must rest. The train has been darkened – it’s time for sweet green dreams. Tomorrow we plan! Previous Previous post: Jenny’s on the Green train! Next Next post: Fog on a lake.